A $500 security deposit authorization is required with this reservation and we will process a credit card authorization in that amount 7 days prior to your arrival. A charge may result for damage to the condo or contents, missing contents, excessive cleaning required after checkout or for exceeding the maximum number of overnight guests. We allow a maximum of 6 overnight guests. With more than 4 guests, a $20 fee per additional guest is charged per day. Falsely representing less guests than are actually staying will result in loss of all deposits and immediate eviction. Please be certain to plan your arrival and departures times accordingly. An early check-in time or a late check-out time may be available and is subject to a fee. Central air conditioning is available at a daily fee. One of the most private town homes in the resort. Spectacular mountain & conservancy views. Great for bird watching. No road noise. Lots of privacy. Grass lawn. Dining table and chairs. Secluded and private entry. No through foot traffic. Comfortable leather couches. Flat screen TV. DVD Player. iPod Dock. Mountain and Conservancy Views. Ceiling Fan. Garage not available to guests. We had a wonderful stay here!Everything was clean and nice. The kitchen was fully stocked with the necessities to prepare meals. Everything worked great in the house. It was very nice for our group that each room had it's own bathroom. We enjoyed the pool and proximity to great snorkeling and beach going.I would definitely stay here again! We had an excellent stay in Townhome N-6! Very nicely decorated, clean, well-stocked with nice dishes, with plenty of room for my husband and two 22-year old boys! The layout of the living room with two nice-sized couches is important to me so that we all had room to sit comfortably! Large dining room table was very nice, too! 3 bedrooms w/ 3 bathrooms was excellent! The location of this townhome is PERFECT! It's super close to Long's Drugs, KTA Market, Bianelli's (great Italian restaurant! ), and to a boat dock where my boys were able to do casual fishing! Our townhome was at the end of the street, and it was very private! I can't say enough about the pleasant feel of staying here! We would LOVE to stay here again! The owner, MEGAN, is nice and very easy to work with. When I had questions, Megan answered them right away! Our experience with Megan and staying at this condo was WONDERFUL! It was perfect for my family! We stayed for two weeks and the home was truly a home away from home.From the ease of booking and the quick turnaround of Q&A from megan, to seamless check in process, to the comforts of the wonderful home, our trip and stay was just perfect.The common amenities were a great and convenient, for both keeping up with our workouts to having our toddler daughter unwind from long beach days at the pool. The home was perfect and managed very well- the home was exactly how it looks in the photos! Starting the day with beautiful mountain views, to ending sunsets/comfy beds/couches/pool/hottub.Thanks for the great stay Megan! Lovely Condos, need more BBQ stations..
We loved the facilities and our condo was very lovely. We like the added security of the gates and access codes and the grounds are maintained perfectly! One thing to mention is that there is only one BBQ station at the pool only and we would have enjoyed using one each night if there were more stations. Also, the swimming pool seemed to be very cold, perhaps colder than the ocean! Overall, a great experience with Na Hale O Keauhou! We would recommend your condos to our friends. Nice and clean and well equipped. We loved it, the Unit was very clean and comfortable! Well stocked with cooking utensils and glasses, especially wine glasses which you definitely need while on vacation:) We really loved that we each had our own bedroom and bathroom for privacy. We would definitely recommend to family and friends. We would love to stay their again on our next visit. Our family takes a vacation every Christmas season. This one was by far the best. Our condo was perfect, in every way. I am a detail kind of person, so those are the things I look at. First off, the place is beautiful. Very open and bright. Everything I could possibly need in the kitchen was there. I dropped my family off, went to the grocery less than a mile away, and we were set! There was shampoo/cream rinse ready in the showers and fresh towels. The master bedroom bed was SO comfortable and I love the (i believe they were bamboo) sheets! I slept so good every night. As a person with chronic back pain, that is worth the whole trip! I could here the waves from bed! Off to the beach, and yes, there were beach towels, snorkeling gear, and sand toys. We went a bought a boogie board and left it there for you to enjoy when you come to stay in this lovely home. Definitely will be back. This townhome was in excellent condition, very clean, well maintained, and stocked with all the amenities that we needed during our stay. It was very comfortable and quiet, and the rates were very competitive (we have stayed in less and have paid more on prior trips). Check in/out was very easy since we were emailed the instructions before our trip, and did not need to check in at a separate location. WiFi was included, it worked and was very reliable. I recommend paying the extra for the A/C, as this property is at a low sea level and it tends to be hotter near the ocean shore. It is very close to a couple of public beaches and a shopping center (within walking distance should you feel like some exercise) The property grounds were immaculate, and the common pool/spa/gym area was a nice plus to have (my only complaint is that this unit has a bit of a walk to the pool as it is one of the farthest units from it, and the pool temperature was a bit too warm, so not as refreshing as I wanted). We would definitely stay in this unit again for our next visit! A wonderful location for a low-key, relaxing Hawaiian holiday! 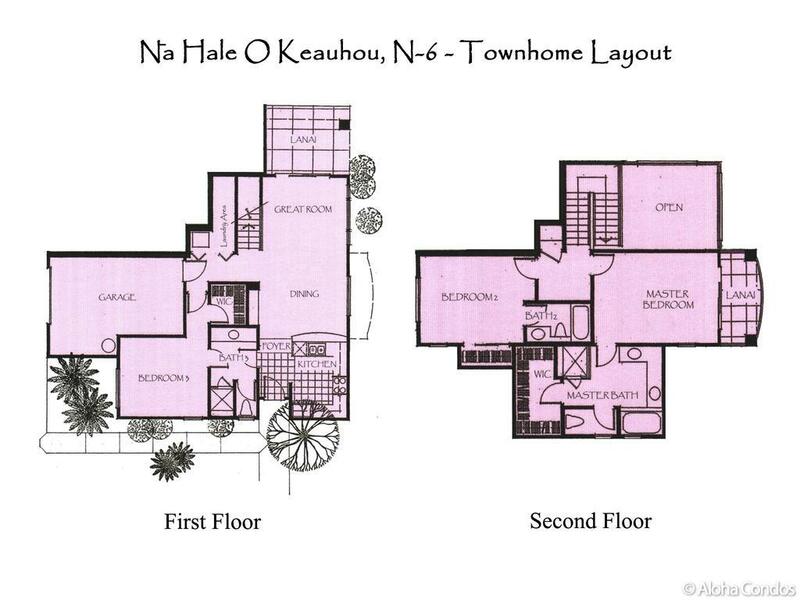 This was our second stay at Na Hale O Keauhou. What a great location: south enough of town to feel secluded yet close enough to amenities and activities. Kahalu'u beach is 90 seconds away. Kealekekua, Honaunau, and coffee farms are all within a short drive. For supplies and groceries, if you can't find it at Long's or KTA next door in the Keauhou Shopping Center, there are plenty of big box stores in town (Costco, Walmart, Target). The only minor disadvantage of this location is that there is a little more traffic when traveling north from the condo on Hwy 11 in the morning and returning south in the afternoon/evening. Not a big deal, but something to keep in mind when traveling to sights/places north. After passing through a gate to enter the property, one passes the pool on the left. There is a freeform pool long enough to swim laps in the morning as well as a hot tub and shallow kid's pool. The grounds are immaculately kept and offer an opportunity to view and appreciate local as well as introduced flora and fauna. There is a trash dumpster and recycling bin hidden near the parking area. Plenty of parking is available, and we never felt like we had to park far from the unit. This was important, as we were traveling with a disabled grandparent. N-6 is a clean and well-appointed and tastefully decorated condo. There is plenty of space in the unit for 4-6 people. It was well-stocked on our arrival with beach umbrella, cooler, snorkel gear, beach toys, and beach chairs. We also found napkins and disposable dishes and utensils for those picnic lunches as well as some condiments for home-cooked meals. There were plenty of cleaning supplies for dishwashing and laundry. The lanais offer a quiet opportunity to soak in the island's natural beauty. One minor disadvantage of this unit is that it does not have an ocean view (read: sunset view) from the common spaces. Another is that there is an A/C surcharge. We found that we really only needed the A/C for a couple of hours in the late afternoon, mostly for the kids and grandparents, after returning from a day of activities. At night and in the morning, ceiling fans were effective at keeping us comfortable. I understand the owners' rationale, but there are other Na Hale units that do not have an A/C charge. We had a wonderful time in N-6 and plan on returning to Na Hale for our next trip to Hawai'i!